At the recent Forbes Under 30 Summit in Philadelphia, Tinder cofounder Sean Rad made the surprise announcement that the company is launching a new premium service in early November. The upgrade will allow paying users more options beyond just swiping left and right. This might make some Tinder fans uneasy. After all, the value of the app is in the sheer number of people using it. Will restricting certain new features to paying customers cause others to drop off and look for other cheaper alternatives for hooking up? Not according to Rad. He says the premium service will include functions that Tinder users have long been asking for - including the ability to travel and use Tinder in multiple cities. Currently, you can only use the service locally, which means if you live in Los Angeles you can't look for hook-ups in New York. But will people pay for this type of technology? Several hackers have taken advantage of Tinder's technology already and used it to create the very features users have been requesting and the premium Tinder will be offering - such as fooling the GPS-based technology into thinking you are in another city so you can scroll through profiles in multiple cities. Also, several hackers have come up with technology to "mass-like" profiles in mere seconds without having to manually scroll through, which is a very popular request from current Tinder users to increase their odds of a match. And what about Tinder's current features - will new users have to start paying for basic services, or will some features be taken away to add to the new premium service? Rad says there will be no changes under the current free app, so users can rest a little easier. Forbes reported that people now swipe through 1.2 billion Tinder profiles a day, and that each day Tinder makes more than 15 million matches. The company needs to hang on to these users because its value is in the numbers. Forbes said the Tinder founder hinted at offering other types of services that go beyond dating, including features for travelers, though he didn't cite anything specific. 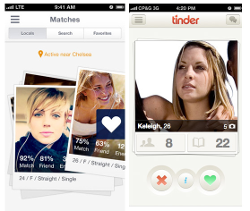 Could we see a Tinder app that includes restaurant, car service, or hotel choices in the near future? Clearly, Rad has big plans for his popular app. But we'll have to wait and see how the market (and their pocketbooks) respond. For more on this dating app you can read our Tinder review.